GenParts are linearized, double-stranded and non-clonal gene blocks that can be used directly or cloned into any vector of choice for diverse applications, such as gene assembly or modification, CRISPR-mediated gene editing, and antibody, protein and pathway engineering. GenParts DNA blocks allow you to generate any natural, modified or de novo sequence without a template and eliminate the need for primer design or PCR optimization. Due to their faster synthesis and affordability, GenParts can be a great alternative to standard synthetic genes for high-throughput applications. *If we can't get it right, we will either repeat the synthesis of the failed fragment free of charge or refund your money. For more details about our service guarantee, check out our Quality Assurance section below. *Production time is calculated using business days. *Orders placed before 12:00PM EST (on business days) will be considered ordered on the same day. *Domestic orders placed within the US are delivered by overnight shipping. *For international order shipping inquiries, please contact us directly. *The indicated “Minimum Number of Clones for Screening” is to have >90% chance of obtaining your desired clone for a DNA fragment with a standard (i.e. not identified as complex by our quotation system) sequence. To receive a quote or place an order, simply enter your desired sequence in our secure GenParts™ DNA Fragments Design & Quotation System. This smart tool can also optimize codons in your sequence(s) based on your desired host expression organism and screen your sequence(s) for complexity. Alternatively, you can discuss your request by phone, fax or email. Customer-designed sequences are submitted to our GenParts DNA Fragments Design & Quotation System . Sequences are reviewed by advanced screening algorithms to flag and alert customers of any potential complexities or irregularities within their sequence. GenScript sequence optimization can increase protein expression by up to 100x when compared to native sequences and by up to 50x when compared to design tools based solely on codon usage tables. The sequence is sent to our production team for a final round of analysis with our patented DSOpt™ sequence analysis tool before the fragment is synthesized with advanced technologies not requiring adapators. Each synthesized DNA fragment undergoes an error correction process to remove potentially-mispaired bases. Finally, synthesized fragments are subjected to batch sequencing, capillary gel electrophoresis and fragment analyzer to verify the size prior to shipment. This procedure helps us establish a high standard for quality performance where for a majority of synthesized DNA Fragments, over 90% of screened clones will contain the sequence of interest. This means that if your order is delayed† or incorrect† †, we will either repeat the synthesis of the failed fragment free of charge or refund your money. † Delayed delivery guarantee is excluded from unforeseen circumstances, such as natural disasters, government action, unexpected social events or loss of package by courier. † † GenScript considers a DNA fragment "incorrect" and subjected to its warranty when the user presents data confirming the wrong sequencing results of the minimum number of clones stated in the specifications table above. Note that DNA fragments, regardless of which vendor provides them, are not the same as synthetic genes; i.e. they are not 100% sequence-verified. Also, note that cloning/screening efficiency is dependent on the cloning protocol and methodology. For high-efficiency cloning methodologies, such as restriction enzyme cloning or Gibson Assembly®, GenScript recommends colony PCR screening of 5-10 clones, followed by sequencing verification of 3-5 positive clones. Fragments with high complexity regions may require screening and sequencing more clones. Also, processes, such as transformation and amplification, can result in mutations and hence, lower sequence fidelity. GenParts DNA fragments are checked for the right sequence size using gel elecrtrophoresis, fragment analyzer and batch sequencing. If you prefer to have a 100% sequence-verified fragment, please use our gene synthesis service, which is fully sequence-guaranteed. Senior Scientist, GenScript USA Inc. Does GenScript provide codon optimization services? Yes! upon your request, GenScript provides free codon optimization on all submitted sequences. Our OptimumGene™Codon Optimization algorithm uses particle swarm technology to evaluate multiple gene expression variables in over 15 different organisms. Results have shown that GenScript-optimized projects have higher protein yield (a) of up to 100x compared to native sequences, and (b) of up to 50x when compared to design tools based solely on codon usage tables. What cloning methodologies are GenScript gene fragments compatible with? GenScript DNA fragments are compatible with all the commonly-used cloning methodologies, including restriction enzyme cloning, blunt-end cloning, T/A cloning, GenBuilder Assembly, Golden Gate Assembly®, Gibson Assembly®, and Gateway Cloning®. After Gene Fragment assembly, how many colonies will I need to screen to obtain my desired clone? Cloning and screening efficiency will be dependent on the cloning methodology and protocols used. For high-efficiency cloning methodologies, such as restriction enzyme cloning or Gibson Assembly®, GenScript recommends colony PCR screening of 5-10 clones, followed by sequencing verification of 3-5 positive clones. Fragments with high complexity regions may require additional screening and sequencing. GenScript scientists have found that after colony PCR screening, typically over 90% of remaining clones will contain your sequence of interest. Can GenParts DNA Fragments be used to modify sequences in a plasmid vector? Yes! GenScript DNA fragments can be efficiently used to modify sequences of up to 2,000 bp with an isothermal assembly method. This allows you to add or remove restriction sites, tags, sequence motifs, selection markers, and other sequences of interest. For more information, refer to our free application note and guide on vector modification using GenParts™. What should I consider when designing GenParts DNA Fragments? In addition to general oligonucleotide design rules (see next question), consider the assembly method you will be using before finalizing the design of your DNA fragment (DNA block). If you use restriction enzyme cloning, remember to add 6-12 bp at the end of each fragment, beyond the restriction site. Many restriction enzymes require additional DNA spacers for efficient digestion. If using an isothermal assembly method, make sure that each DNA fragment (including the cloning vector) shares a 15-40 bp homology sequence at each terminus. What general factors do I need to consider when designing DNA fragments? Poly-A and poly-T motifs should not surpass 14bp in length. Poly-G and poly-C motifs should not surpass 10bp in length. Poly-A/T motifs should not surpass 50bp in length. Poly-G/C motifs should not surpass 25bp in length. Inverted repeats, direct repeats, tandem repeats, and palindromes should be avoided when possible. You can also use our DNA Fragment Design Tool for an in-depth analysis of the complexity of your sequence. What options do I have if my sequence is flagged as complex? Our scientists will personally evaluate your submitted sequence to determine the feasibility of synthesis regardless of the sequence complexity. A quoted analysis will be sent within 24 hours of your submission. To avoid sequence complexity issues altogether, you may want to select the GenScript codon optimization option which will screen and remove complex features, while maximizing protein product yield. 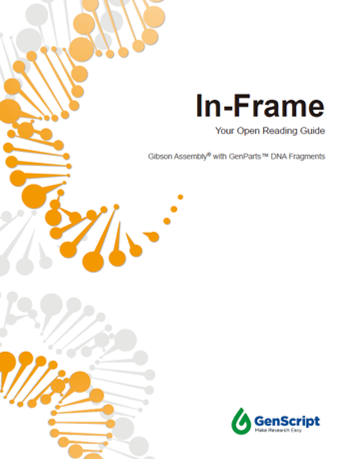 What if I require customized DNA fragment reagents or deliverables? GenScript tries its best to accommodate customized requests. When ordering, please indicate your specific custom needs in the comment box. Alternatively, you can email our Ph.D.-level technical support staff at gene@genscript.com. GenBuilder™ DNA Assembly Mix New!